(H-Net online). It is hard to escape the feeling that the press changed the title of this book to reflect the headlines coming out of Damascus today. 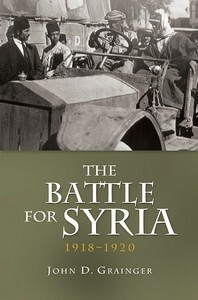 Except for a brief conclusion and parts of the introduction, this book is not exclusively, or even mostly, about Syria. It deals with Palestine and Egypt as much, if not more, than it does with Syria. Thus the book really analyzes the entire British campaign for control of the Middle East from 1917 to 1920, mainly from the British perspective. At base, it argues that the diplomatic agreements made during the war had far less to do with the final settlement in the region than the military achievements (and a few failures) of the British army under Gen. Edmund Allenby. As British military power waned, so, too, did the extent of British reach, leaving the borders roughly where they are today. John D. Grainger. The Battle for Syria, 1918-1920. Woodbridge: Boydell & Brewer Ltd., 2013. 270 pp. $45.00 (cloth), ISBN 978-1-84383-803-6. Reviewed by Michael Neiberg. Commissioned by Margaret Sankey. This book is, in the final analysis, a military history. Grainger provides a great deal of detail on the movements of the British army, down to the regimental level. In fact, he provides far too much tactical detail for the purposes of the book. We learn much more about the Australians, New Zealanders, and Indians in the larger British army than we do about the Arabs, the Ottomans, or the French. Grainger sees the Arabs as a fissiparous group, much more interested in looting their allies and fighting one another than in serving as a viable force against the Ottomans. Although the approach is largely conventional, Grainger takes careful aim at several myths. He sees T. E. Lawrence (“Lawrence of Arabia”) as a vain amateur whose own self-delusional memoirs are virtually worthless. And while he, like most scholars, praises Allenby for his methods in the Palestine campaign, he does not shirk from criticizing Allenby’s slow movement into Syria. Perhaps more importantly, he shows that the Ottoman Empire retained significant combat power, even after the signing of the armistice. The rise to power of Mustapha Kemal after the war re-energized Ottoman forces at the same time that demobilization pressures weakened the British. Thus, Grainger rightly reminds us, we cannot stop our study of the Middle Eastern war on the European timeline. November 11, 1918 might make sense in Paris, but not in Damascus. Consistent with the book’s central arguments, Grainger argues that neither the Arabs nor the French made enough of a military contribution to have a say in the final outcome of the borders of the Middle East. The French even lost Mosul, originally in their zone of influence under the terms of the Sykes-Picot Agreement. That agreement, like the Balfour Declaration, had political and social implications (both angered the Arabs with whom the British and French would have to work) but it was, in Grainger’s analysis, always subject to the military ability of the British or the French to enforce them. Disappointingly, especially given its title, the book dedicates just one thirteen-page chapter to the French war to control Syria. Having lost any chance at Palestine, France made a stand in both Lebanon and Syria in order to increase its influence in the Levant not just at Arab expense, but at British expense as well. The French found the region an absolute shambles, the war having destroyed most of its financial, agricultural, and transportation infrastructures. The French needed to establish a government to deal with these problems, but lacked the military power to coerce recalcitrant Arabs into doing their bidding. Consequently, the Arabs concluded that they need only wait the French out, while France offered the Arabs too little to get their cooperation. Moreover, as Kemal’s power grew in Turkey, the possibility existed that the Ottomans and Arabs might form an alliance of convenience aimed at kicking the French (and the British) out of the Levant for good. France thus found itself in an untenable position, one the British made worse by implicitly supporting the Arabs under Lawrence’s friend and Arab revolt leader Emir Faisal. The mandate system devised for the Treaty of Versailles abated, but did not solve, the crisis. This discussion is fine as far as it goes, and Grainger’s great contribution in this book is to put the Middle Eastern war in a wider context than some previous scholars have done. But given the putative focus of the book on Syria, a lack of French sources is a serious problem. What he presents is less the French viewpoint than the British sense of the French viewpoint. We hear more about Allenby’s views of the situation in Syria than we do about those of Henri Gouraud, the flamboyant French commander in Syria. The talkative and boisterous Gouraud was not shy about sharing his views. It is a great pity that they do not appear here. Nor do we get an understanding of the viewpoints of French diplomats. In fairness to Grainger, I suspect that this book was meant all along as a general overview of the British war in Palestine and Syria, not a detailed investigation of France’s war in the latter. In that task, he succeeds well. Few of the details in here will come as a great shock to specialists in Middle Eastern history or in the history of World War I. Nevertheless, the presentation here is more detailed and placed in a wider context than most. Still, in the final analysis, this book tells us far less about Syria in these crucial years than it promises. That is unfortunate, because Grainger has written widely on the Middle East and, as he notes in the conclusion, is one of the few Western scholars to have spent any sizeable time in Syria. One hopes that in the future he might dedicate himself to a real, in-depth study of the impact of the First World War on Syria and what it tells us about the crisis there today (agosto 2013).